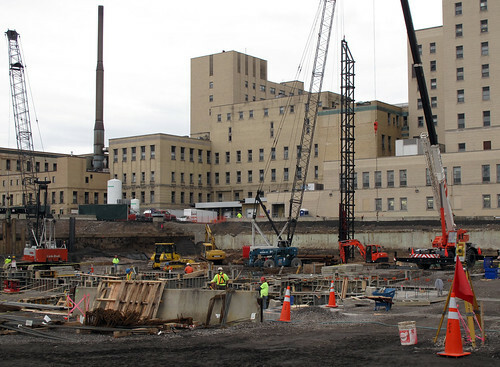 A Friday afternoon snap from the top of the City's parking ramp on Ellicott Street shows crews working on the foundation of the new Global Vascular Institute adjacent to Buffalo General Hospital. 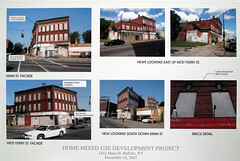 The Kaleida/UB picture archive traces the development of this and some of Kaleida's other projects in the neighborhood. 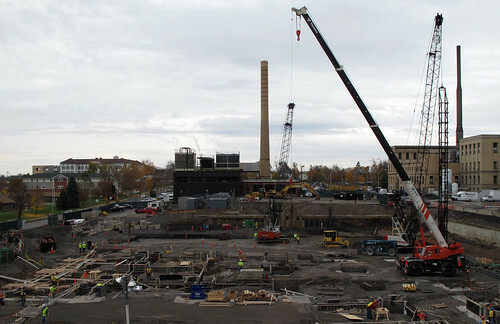 Similar interval shots from the same parking ramp perspective will be added on a regular basis during construction. See the Kaleida Archive for additional information and posts. Friday morning's press event at the corner of Main & Ferry unveiled another piece of the puzzle in Midtown Buffalo's development. 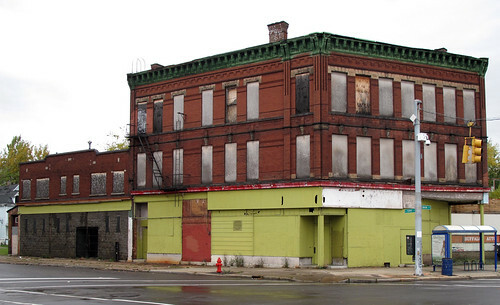 Housing Opportunities Made Equal will be make this architecturally significant late 19th century commercial building their new home. According to officials a closing date will be set and construction will begin shortly after the anticipated financing is finally assembled. 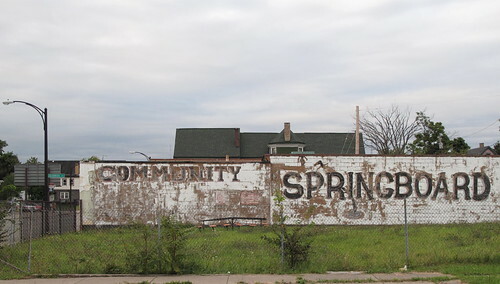 HOME recently celebrated its 45th year of advocating for fair housing here in Western New York. 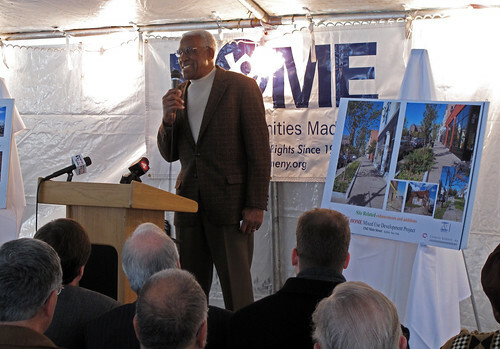 During Friday's press conference, former Buffalo Bill's tight end Ernie Warlick spoke about his experience with housing discrimination in 1962 when he first arrived in Buffalo. 1542 Main Street was purchased five years ago by local preservationist Scot Fisher and his wife who live in the neighborhood. During their watch, the building was sealed, the roof was repaired and fire and smoke alarms were hard wired - in short, the building was mothballed in such a way that other vacant property owners - and Housing Court - should take note. 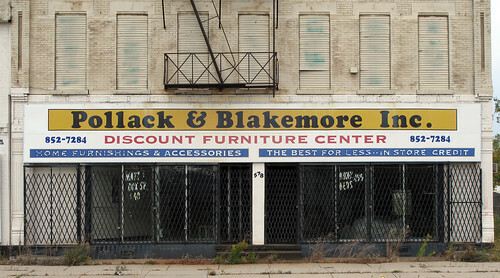 This is the sort of stewardship that preserves the opportunity for a building's successful future reuse. 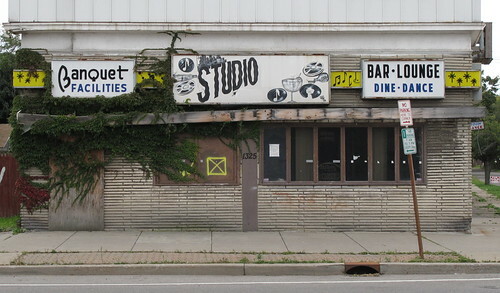 Architect Charlie Gordon described the site's importance as a unique focal point for Buffalo - a place that will help reconnect a City divided by class and race along two sides of Main Street. 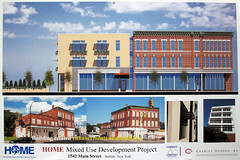 Charlie presented the following renderings. 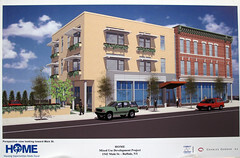 The yellow brick building will replace the existing two story structure behind 1542 Main. Construction updates to follow in the coming months. Late last week four heritage properties that appeared on the City's list for the annual tax foreclosure sale were profiled - links to four posts - and by 1pm today the auction results were known. 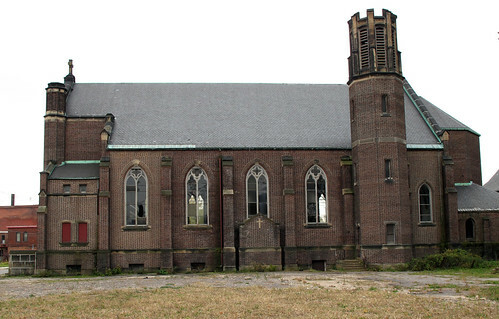 St. Matthew's on East Ferry was redeemed at the eleventh hour and never made it to the auction block. 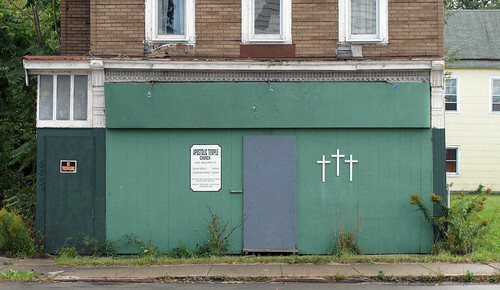 Sacred Heart on Emslie opened at $15k, no one bid and was adjourned. Ahavath Sholem Temple on Jefferson opened at $15.5K with one bidder who later defaulted for not paying a deposit. It was later reopened and after no one bid it was adjourned. 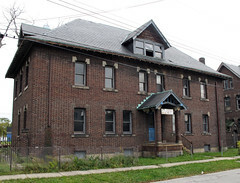 The Pierce Arrow Power House on Elmwood opened at $35K, no one bid and was also adjourned. When an auction item is adjourned the property remains in the possession of the same individual or entity as it was prior to the auction. A number of veteran auction observers, seasoned local investors and neighborhood activists mentioned that they'd never seen so many properties on the City's in rem list. When asked if they'd thought it was a good idea that so many properties were 'adjourned' - when the City had the opportunity to take possession of the properties - answers were mixed. 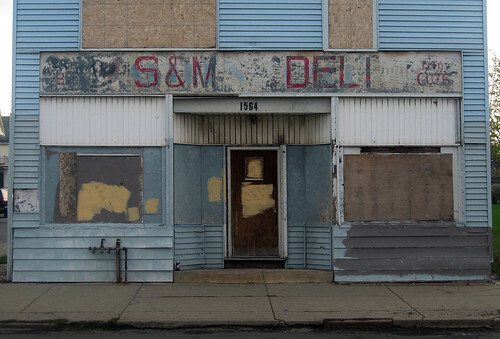 In the past the City would typically take possession of a property and either demolish or sell it. This year it appears as though the City is simply postponing the inevitable; the demolition of 1000's of additional structures. While there were a number of residential properties, real gems, ready for renovation - an overwhelming number of these houses were actually demo candidates. 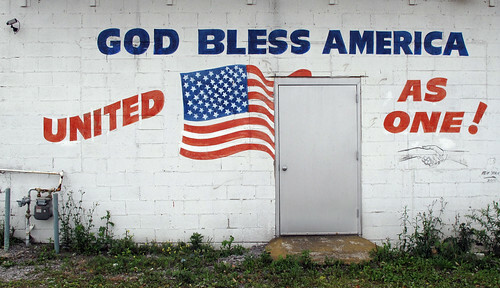 The message is clear. If you own a property - run it into the ground - and default on your taxes, there's no consequence. 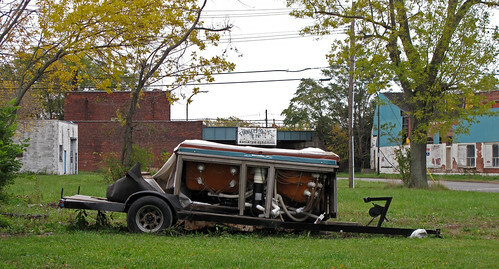 For large parts of the City's East Side, the promise of a bulldozer coming down the street was just postponed, indefinitely. 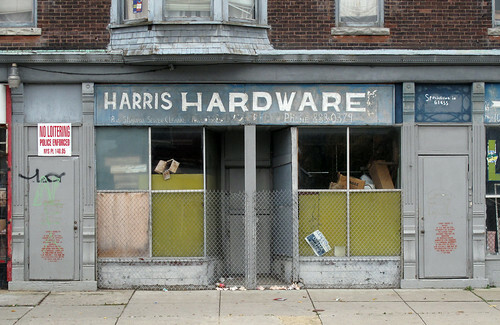 The future of these four heritage properties - absent a responsible level of interest and investment - remains uncertain. There were two related Buffalo News articles that appeared this morning. Church Sales spur Debate - already has a growing comment stream and mentions Transfiguration Church on Sycamore Street as the poster child of Diocesan neglect. Here's the Transfiguration Archive - a frequent subject of posting here at fixBuffalo - for additional information and amazing pictures. 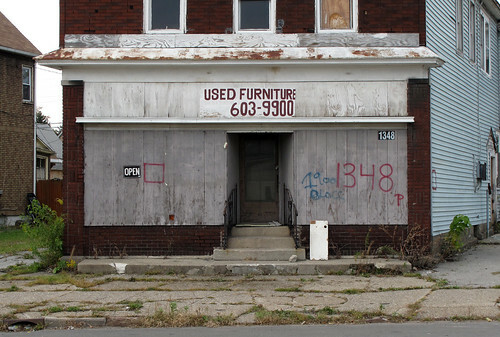 Brian Meyer has this story about the City's foreclosure auction. The Power House of the Pierce Arrow Motor Car Company was built in 1911. Symbol of the Machine Age, master work of America's best known industrial architect, Albert Kahn, and representation of the muscularity of buffalo's manufacturing economy, it is now up for auction. 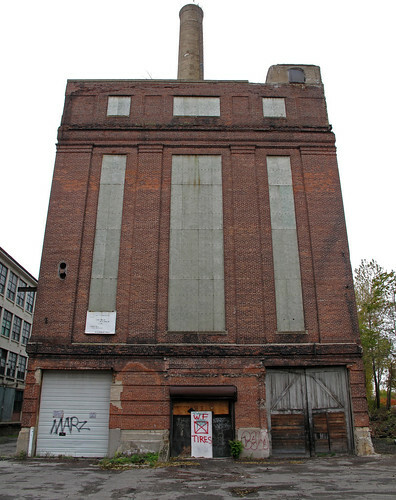 The Power House is listed on the National Register of Historic Places and is ready for the kind of investment that New York State Rehabilitation Tax Credit has made possible. The world's first integrated automobile factory - where raw materials came in and finished automobiles rolled out - the Pierce Arrow Motor Car Company, according to a reliable source, is one of the most intact early 20th century automobile complexes on the planet. The Power House is the capstone. It appears to be in structurally stable condition, with numerous cosmetic concerns. 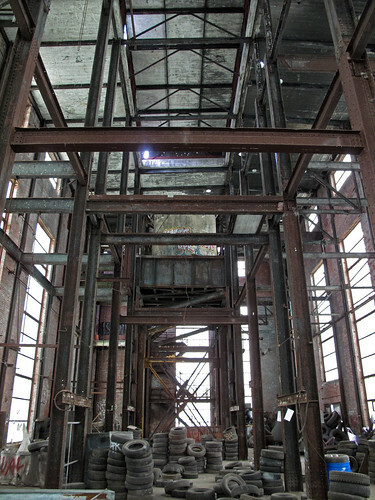 The interior space is one of the most compelling in the city, it soars four or five stories from its second story base, and the stack is suspended in mid-air by a steel latticework. Simply stunning. Power houses are some of the most adaptable structures that exist. 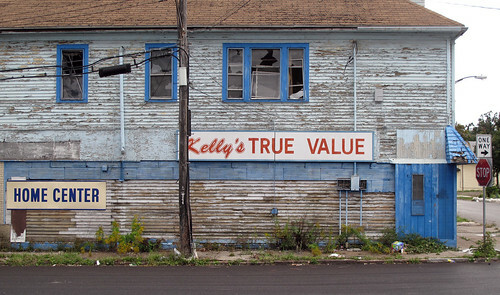 The Pierce Arrow Power House is less than a mile from the Albright Knox and the Burchfield Penny art galleries. 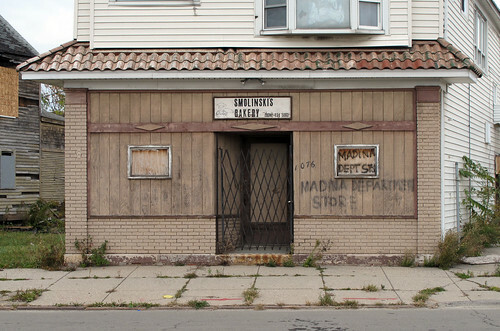 It's located at 1727 Elmwood Avenue. 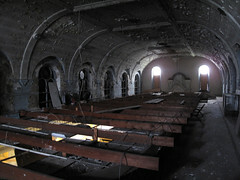 The current owner has been in tax arrears for years and has recently abandonded the structure. Check back next week for auction results. 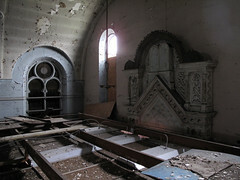 The synagogue here at 407 Jefferson Avenue was built in 1890 and was once the largest place of Jewish life on the City's East Side. Along with the forgotten Beth Jacob Cemetery at the end of Lansdale Street, Ahavath Sholem remains one of the last vestiges of Jewish life east of Main Street. 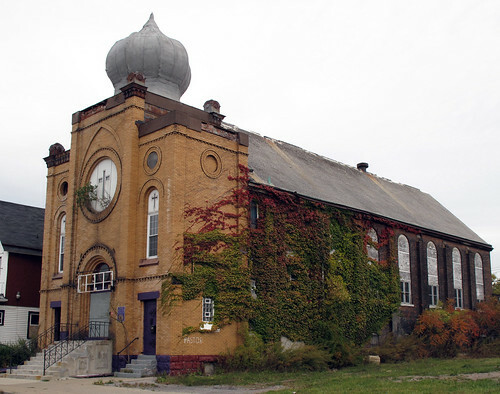 According to City records the synagogue was sold to Saints Home Church of God in 1960 and in 1982 Greater New Hope Church congregation bought the building. The congregation had listed the property as late as December 2007 - see pic - with a local realestate agent when the property was still sealed. Based on utility records that were found strewn about the office last week, it seems as though Greater New Hope abandoned the place in 2006. 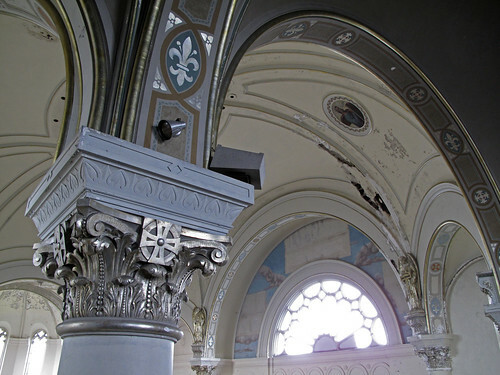 With a number of other religious and heritage properties on the auction block at next week's tax sale - that are structurally sound and in much better condition than the former Ahavath Sholem synagogue - the future of this place remains uncertain. The pictures in the following slide show - Ahavath Sholem slide show - clearly show what happens when the wind, weather and water are allowed to penetrate a building's shell. Make sure to check - City for Sale - Part I for additonal information about the city's annual tax sale and a link to the user friendly spreadsheet and searchable data base. 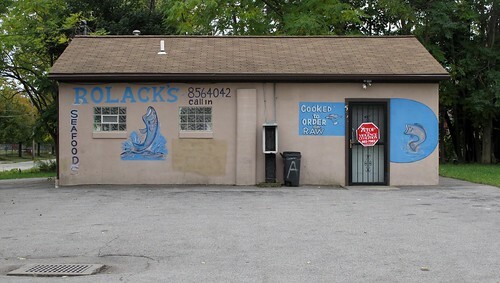 City for Sale - Part II and yesterday's Part III include numerous pics and a profile of two additonal religious heritage properties that are on the auction block next week. Check back next week for the auction report. 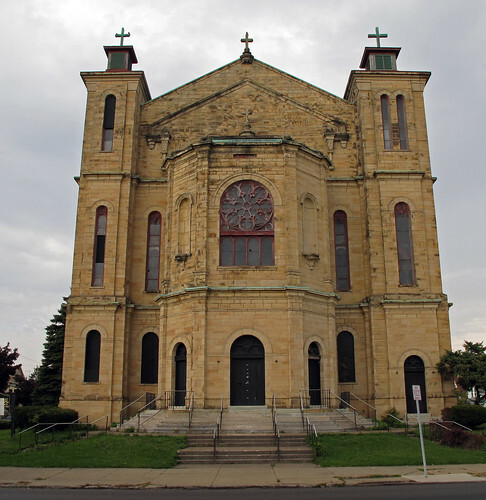 According to City records the congregation known as Witness Cathedral purchased Sacred Heart Roman Catholic Church and three adjacent religious buildings in 1988. 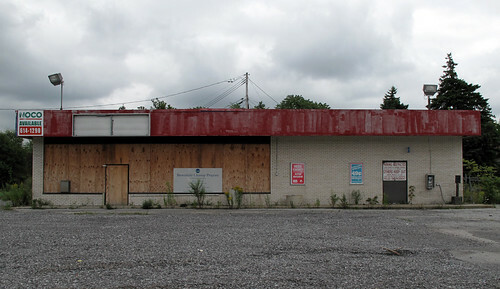 Twenty years later the property - sans school, see the devastating demolition from last February - is now on the City's auction block. The three buildings, situated on a one acre lot, include the church building, the priest's residence - immediately behind the church - and convent, both of which front on Watson Street. The Larkin Company's expansion nearby in the Hydraulics led to the construction of this complex in 1913 when the company needed a parking lot. The local Diocese sold this space in 1977 to a Ukrainian congregation. They reportedly struggled with the complex after a neighborhood propane explosion in 1983 blew out the stained glass windows. 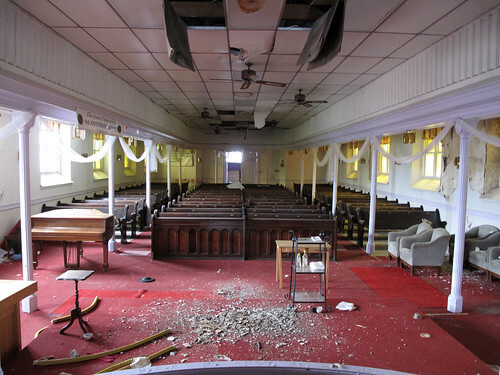 The current owners, according to neighbors, abandoned the church in 2007 and are currently mired in what appears to be an eight year long housing court case, according to city records. While the Church building appears intact and structurally sound there were a couple dozen slate shingles in the alley between the church and an adjacent city owned house yesterday afternoon. Interior pictures over the years have been impossible to get. These two other buildings appear to have a few small roof openings, yet appear rather sound. Here's the post and complete listing for next week's annual tax sale - City Sale Part I. The spreadsheet and database are user friendly. 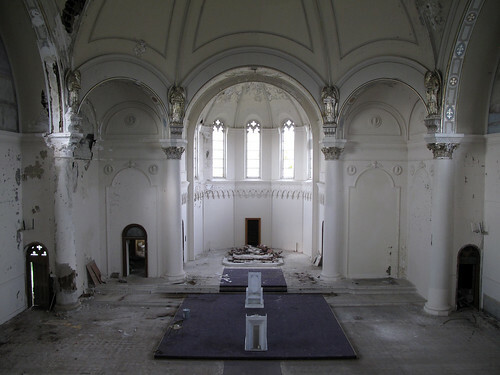 If you're interested in other religious and heritage properties on this year's list, make sure to check out City For Sale Part II for another amazing live/work possibility. Check back next week for some auction follow-up and for tomorrow's post - the last of three heritage properties will be profiled that will be available at next week's tax auction. While reviewing the City's inrem listing - story here - for next week's tax foreclosure sale, St. Matthew's Church at 1066 East Ferry Street is topping the list - again. 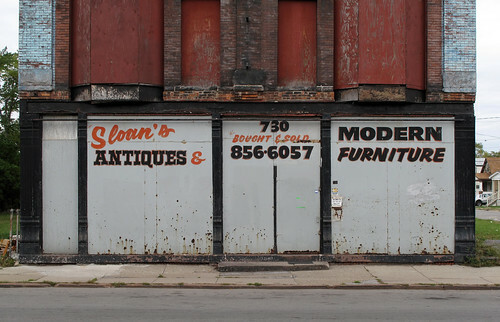 fixBuffalo readers may remember a series of posts about the last time this heritage property was sold - here's the archive - by the City, at the 2006 tax sale. 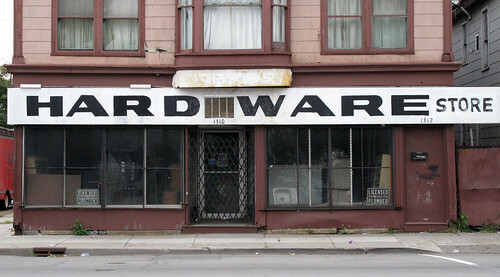 A truly amazing space that's ripe for the right person to pound into a creative live/work space. The possibilities here seem endless. St. Matthew's first opened in 1928. For seventy years - with the adjacent school, convent and priest's residence - St. Matthew's served a parish that declined by the decade. 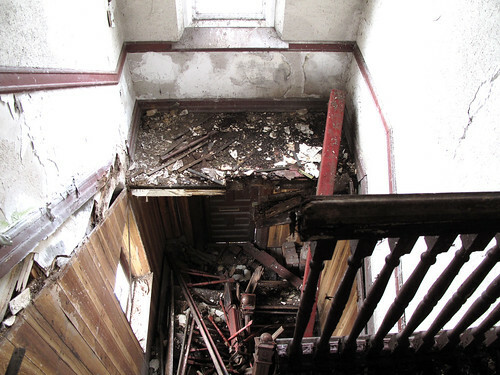 In 1998 the local Diocese split the property and sold the church building for $22,000 to a congregation that abandoned the premises six years later. 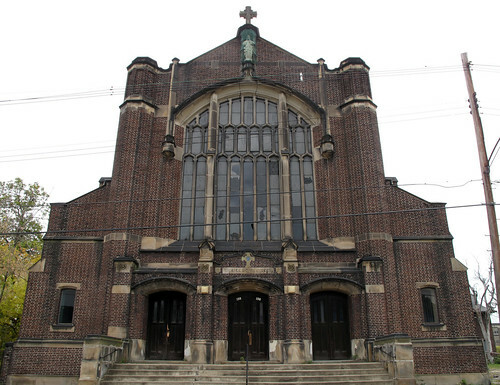 As that congregation became delinquent with water bills and user fees, the City sold St. Matthew's for the staggering sum of $3500 (yes - three thousand five hundred!) in 2006. While the current owners attempted to sell the church on eBay a number of times during the past two years, deals collapsed. If past experience is any guide for this year's auction - the next person or group willing to part with $3500 - with a cool plan in hand - will own one of the most amazing spaces currently available in the City. Check back next week for the City's auction results and report about what's happening with St. Matthew's. Tomorrow, another heritage property, yet another church on the auction block - with some equally amazing buildings, parish hall, priest's residence and former convent included. Sort of amazing and staggering. Props to City Hall for sealing the roof here at 16 Harwood Place. I understand that Mayor Brown has recently taken an interest in the Lyth Cottage. I've been profiling here - 16 Harwood Archive - and showing this splendid little small house to prospective buyers for the past three years. The Lyth Cottage has been in a shambles for the past year with the roof blown out - here - and a recent series of inside pics shows what water does when a roof is compromised. 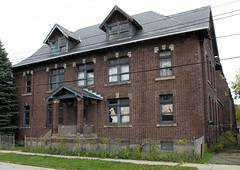 The City has owned the Lyth Cottage of the past decade and the next step is to find someone who would like to make this amazing place home - a place that intersects so well with Buffalo's industrial past and architectural legacy in the City's largest preservation district - in Hamlin Park. For those of you who might be interested in just such a heritage renovation project, you should know that preservation standards allow for significant design flexibility if you can imagine a more modern addition to this place. For a sensitive and thoughtful project that a spot like this demands, the standards aren't as restrictive as you might have expected. Here's the 16 Harwood - Lyth Cottage archive - exterior pics & interior pics. The city's tax foreclosure auction - inrem 43 - opens next Monday October 26 and runs for three days at the Convention Center. 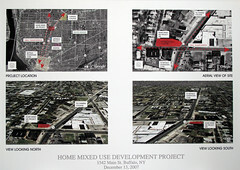 Here the details from the City's site. 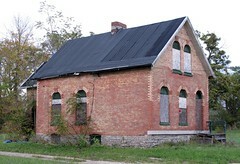 The Property Foreclosure Auction will be held October 26, 27 & 28, 2009. Registration will start at 7:30 a.m. The Auction will start at 9:30 am. The auction will be held at: Buffalo Convention Center, Convention Center Plaza, 153 Franklin Street, Buffalo, New York 14202. 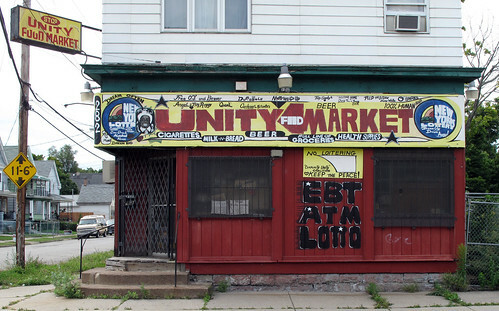 Someone has compiled a user friendly spreadsheet and accessible data base to search for what's been called by a number of housing activists the longest list of properties ever assembled for auction in the City of Buffalo. I've reviewed the entire list. There are a number of amazing residential - east and west side - light commercial and industrial properties on the list this year. In addition, there are three heritage properties that I've profiled and posted about in the past that appear this year for the first time and one for the second time. I'll be posting about these in the next few days. Staggering. Really. Please consider commenting here if you're living somewhere beyond the city's limits where laws and regulations allow for the disposition of real property - that's tax delinquent - in different and perhaps more creative or effective ways. Said otherwise, are there ways to handle the dynamic - non payment - in ways that are more respectful and sensitive to neighborhood preservation and an individuals capacity to remain current with property taxes and fees. Doors Closed opens on Amherst Street Friday evening October 16th from 6-10pm. 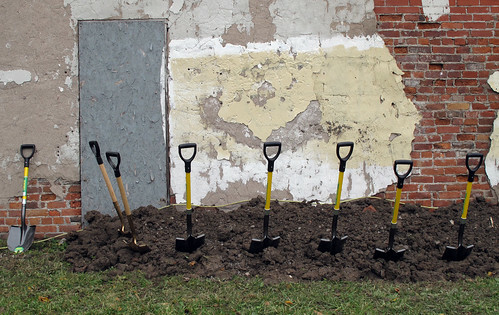 Featuring the photographic work of seven regional photographers of the lesser known and forgotten urban landscape, the show is the perfect counter-point to Doors Open 2009 the amazing collection of heritage sites that runs this Saturday and Sunday. 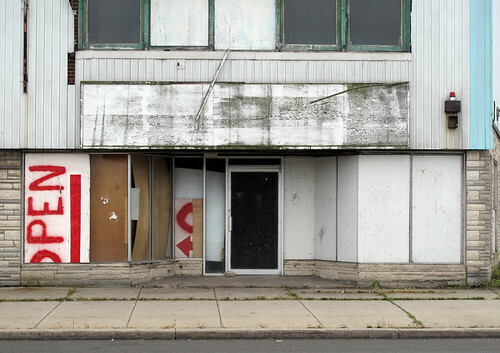 FixBuffalo readers are already familiar with my Red Mark of Death series, the spray painted language that appears on city houses indicating various stages of abandonment and decay. 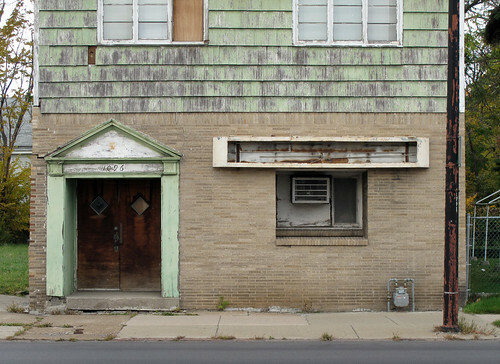 Friday night a new series of residential portraits that intersect with failed urban policy and the enduring persistence of nature will be on display at Doors Closed. I'll post some of them here next week. Friday night - 464 Amherst Street, check it out.